If you missed Gov Ball and Northside Festival, you’re in luck -- an outdoor fest featuring far more than just live music is coming to NYC this weekend. 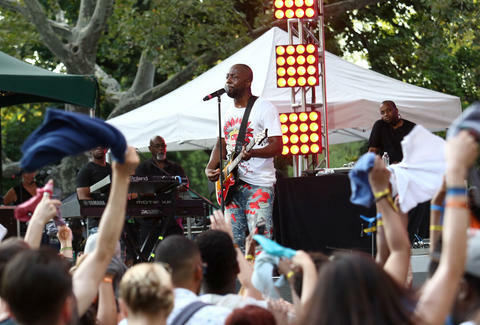 Ozy Fest, the outdoor interactive festival hosted by digital news magazine Ozy, will be returning to Central Park’s Rumsey Playfield for the second time on Saturday, July 22. Billed as a mix between South by Southwest and Coachella, the all-day party is stacked with live music, comedy, provocative panels, and a culinary program designed by celebrity chef Eddie Huang. There’s even a shopping area to pick up all things food, drink, and apparel. Aiming to bring journalists, comedians, musicians, entrepreneurs, athletes, and chefs all under one (outdoor) roof, the event will feature performances by Jason Derulo, Zara Larsson, Samantha Bee, Issa Rae, RuPaul, and Talib Kweli on the main stage, as well as debates and panels led by hosts including Katie Couric, Ta-Nehisi Coates, Malcolm Gladwell, Adam Grant, Van Jones, Grover Norquist, Von Miller, Whitney Wolfe, Michael Moe, and more. The event runs from 12pm-10pm on Saturday, and general admission tickets can be purchased on Ticketfly starting from $25. Amy Schulman is an Editorial Production Assistant at Thrillist. Follow her on Instagram.